Six-pack abs are sought after by most of the women. Although it requires a lot of effort, women can achieve six-pack abs by sticking to healthy diet plans and powerful exercises. Body-fat percentage must be low to see toned abdominals which may otherwise be hiding under layers of fat. Be on your way to bare abs with a combination of cardio, core strengthening, and diet. Six-pack abs are a promise of magazine articles and supplement advertisements. But obtaining this flawless look isn’t as easy as drinking a protein shake. So, how to get six pack for women? There is no quick or easy way to get six-pack abs. It involves passion, struggle, and commitment to a clean, healthy eating and regular exercise. But while the process can be long and hard, six-pack abs are a fitness goal that can be attained by those who are completely committed to the process. 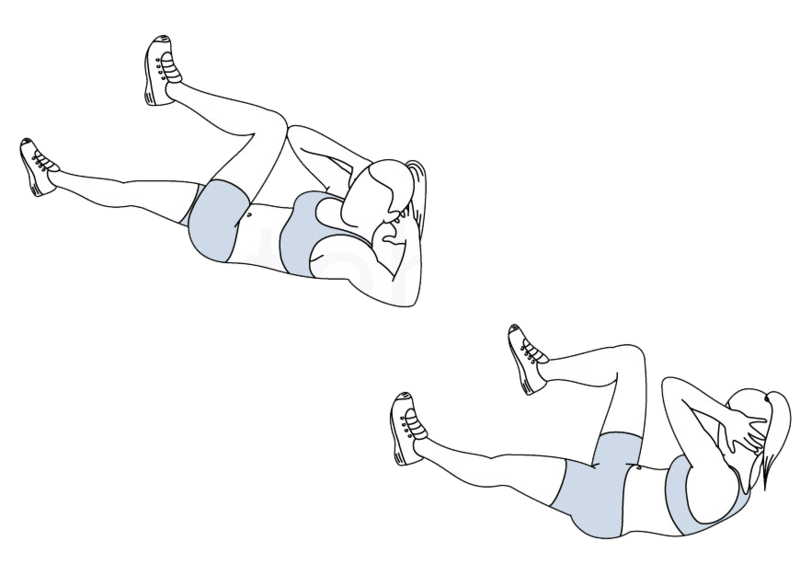 You can get a clear buttock or violin hip reduction during six pack abs training. To achieve the best results, you need to regularly challenge your body in different ways. You can start right now, with this list of the best new exercises for every part of a woman’s body. Lie on the floor and place your feet in a way under something that will not move or by having a partner hold them. Your legs should be bent at the knees. Elevate your upper body so that it creates an imaginary V-shape with your thighs. Your arms should be fully extended in front of you perpendicular to your torso and with the hands clasped. This is the starting position. Twist your torso to the right side until your arms are parallel with the floor while breathing out. Hold the contraction for a second and move back to the starting position while breathing out. Now move to the opposite side performing the same techniques you applied to the right side. Begin in a seated position with your knees bent and your feet resting lightly on the ground as you balance on your sit bones. Lengthen through your torso and recline slightly, avoiding any rounding of your back. Extend your arms straight out in front of you, then extend your legs, creating a V-shape with your torso and legs. Breathe comfortably throughout the move. Hold for 30 seconds. After holding boat pose for 5 seconds, recline a bit more, and lower your legs, allowing your legs and torso to hover just a few inches off of the ground as you balance on your sacrum Hold this variation for 5 seconds, then rise back up and hold. Start with a plank position on your mat. Keep your abs engaged and arms straight, while keeping your whole body in a straight line. Inhale and lower the hips while moving the torso forward so shoulders are over hands. Lift your right leg up and hold for one breath. Exhale and lower your leg. Raise your hips and return to the previous position. Repeat this move as many times as you can in 2 minutes, with both legs. Lie flat on your back. You can extend your arms so they’re against the sides of your body with your hands pressing into the floor, or you can bend your elbows and place your palms under the back of your head. Bend your knees and hold them near your ribs. This will make it easier to pull your navel in towards your spine and actively press your lower back flat on the ground. 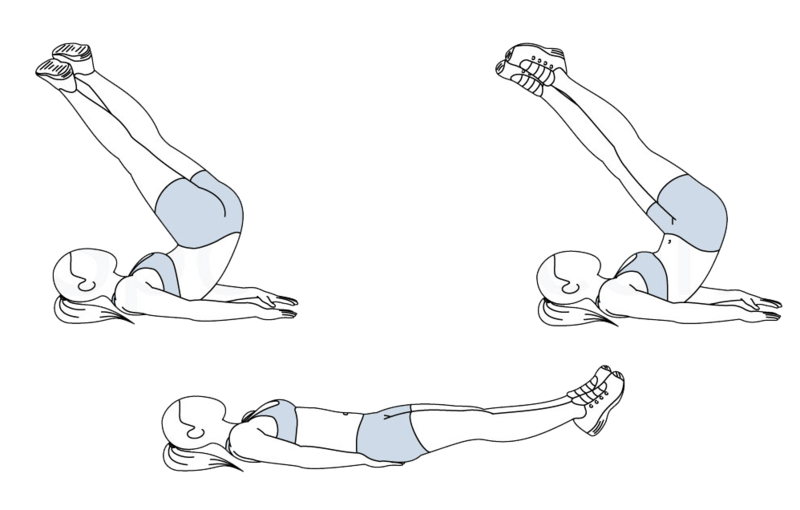 Lift both legs straight up toward the ceiling, continuing to engage your abs and press your lower back into the ground. Keeping your core strong, slowly lower your right leg down toward the ground, until it is a few inches above. Then scissor your legs, so you lift your right leg back up as you lower your left leg down towards the ground. Keep the movements slow and steady, moving with control, and keeping your core engaged the entire time, and your lower back pressing into the floor. You may not feel this until you do it for a while, so repeat this move for a total of 20 to 30 times on each leg. Lie flat on your back and place your hands behind your head. Bend your knees and bring them up so that your thighs and hips form a 90-degree angle, calves parallel to the floor. With elbows flared lift your shoulder blades off the floor and hold the position. Twist your upper body in one direction bringing the elbow to the opposite knee while fully extending your other leg. Hold and then return back to the starting position to repeat in the opposite direction. Start with a plank, put your hands over your shoulders and weight on just your toes. With your core engaged, bring your right knee forward under your chest, with the toes just off the ground. 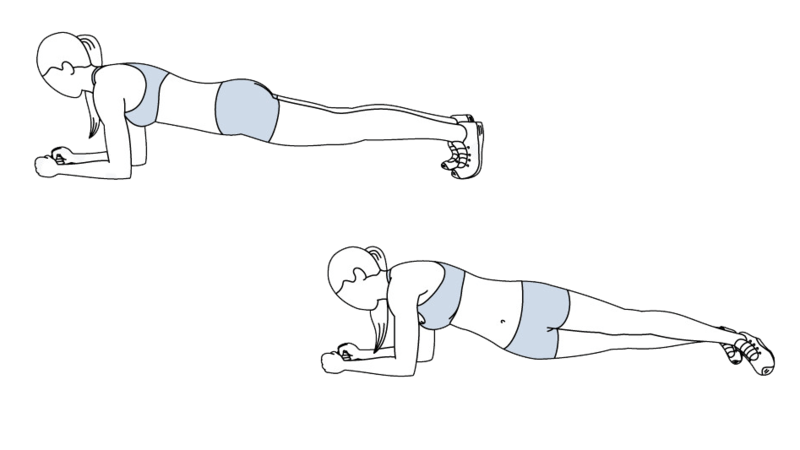 Return to your basic plank. Switch legs, bringing the left knee forward. Continue running in your plank for one minute. 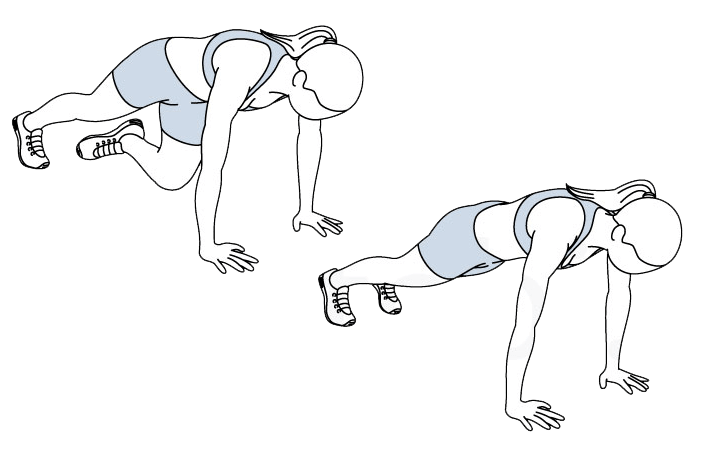 Start with a pushup position, your body forming a straight line from your head to your heels. Brace your abs and hold them that way for the entire exercise. Now pull your left knee as close as you can to your right elbow, without allowing your hips to sag. Return to the starting position and repeat, this time raising your right knee toward your left shoulder. Continue to move back and forth. Lie on your back on the floor with your right leg straight and flat on the floor. Your left knee should be bent and your left foot flat. 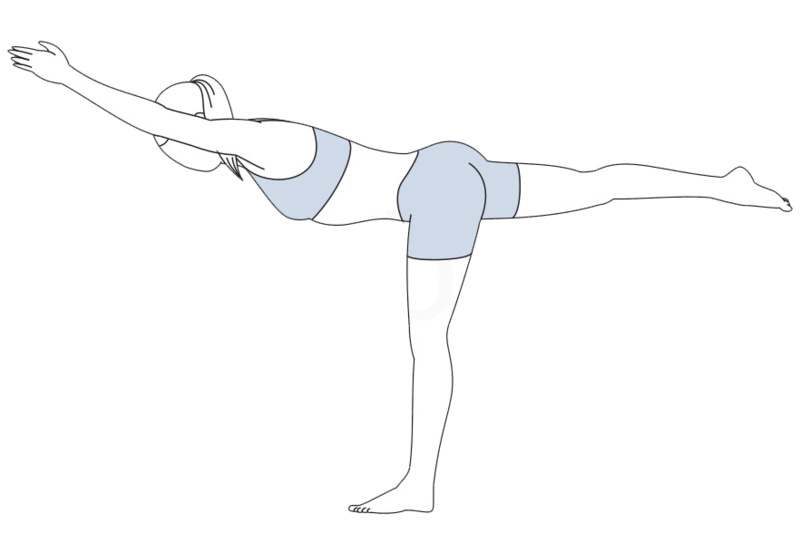 Place your hands’ palms down on the floor underneath the natural arch in your lower back. Slowly raise your head and shoulders off the floor without bending your lower back or spine, and hold this position for 7 to 8 seconds, breathing deeply the entire time. Do 3to 4 reps, then switch legs and repeat. To make it even harder, raise your elbows off the floor as you curl up. Lie on your back on the floor with your knees bent and your feet flat on the floor. Now brace your core, squeeze your glutes, and raise your hips so your body forms a straight line from your shoulders to your knees. Hold for 3 to 5 seconds and squeeze your glutes tightly the entire time. Lie on the ground in a traditional crunch position, your feet flat on the floor and hands underneath your head. Press your lower back into the floor and pull in your belly button to lift your feet off of the floor. Keep your knees together, bent at 90-degree angles. Using your core, pull your knees into your chest so that your tailbone raises off of the ground, and simultaneously perform a traditional crunch, lifting your shoulder blades off of the floor. Use your abs, not your hands, to lift your head and shoulders. Your hands are just there to protect your neck. 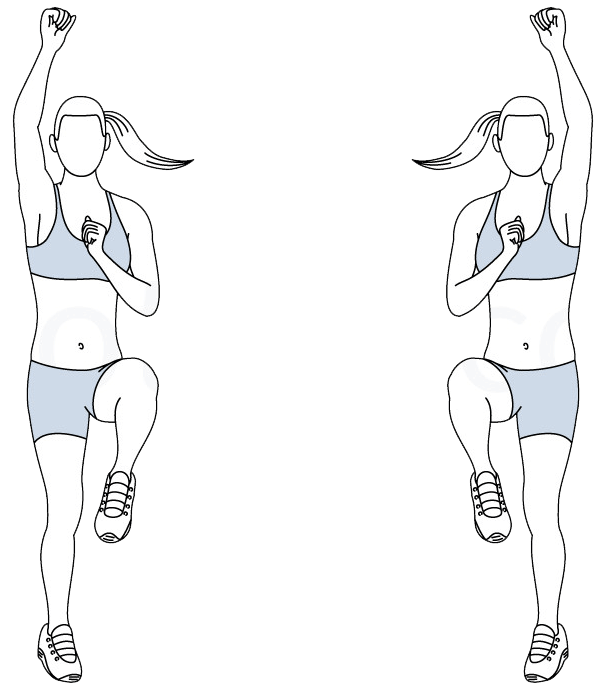 Slowly lower your shoulders, hips, and legs to return to the starting position. Stop when your feet are just above the floor. Repeat the movement, making sure not to use momentum to power your next rep. Focus on squeezing those abs! Hold your arms straight over your head and crunch your shoulders off the floor. Bring your left leg toward your chest and touch your big toe with your right hand. 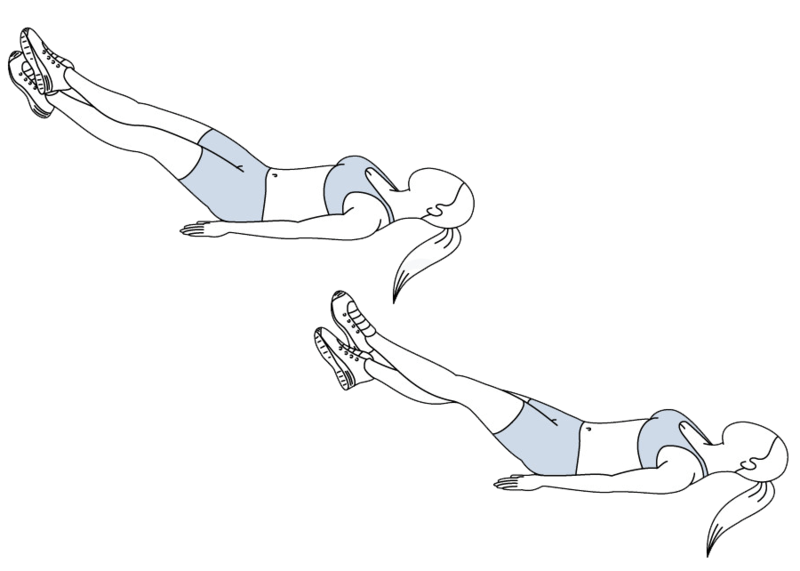 Lie on your left side and set up in a side plank, with your legs straight and your weight resting on your left forearm. Align your body so it forms a straight line from your neck to your ankles and put your right hand on your hip. Lift your left leg and bend that knee, bringing your foot next to the inside of your right knee. Put your weight is now resting on your left forearm and the inside edge of your right foot. 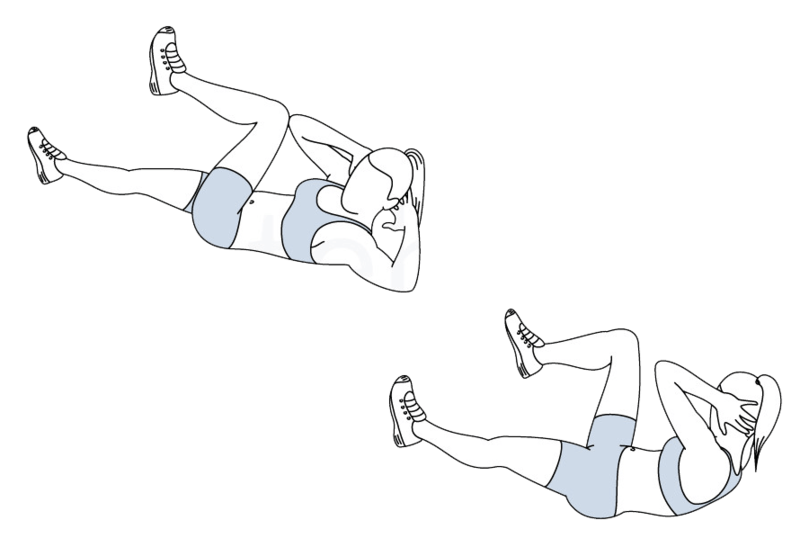 Lie flat on the floor with your lower back pressed to the ground and pull your navel in to also target your deep abs. Put your hands behind your head, then bring your knees in towards your chest and lift your shoulders off the ground, but make sure not to pull on your neck. 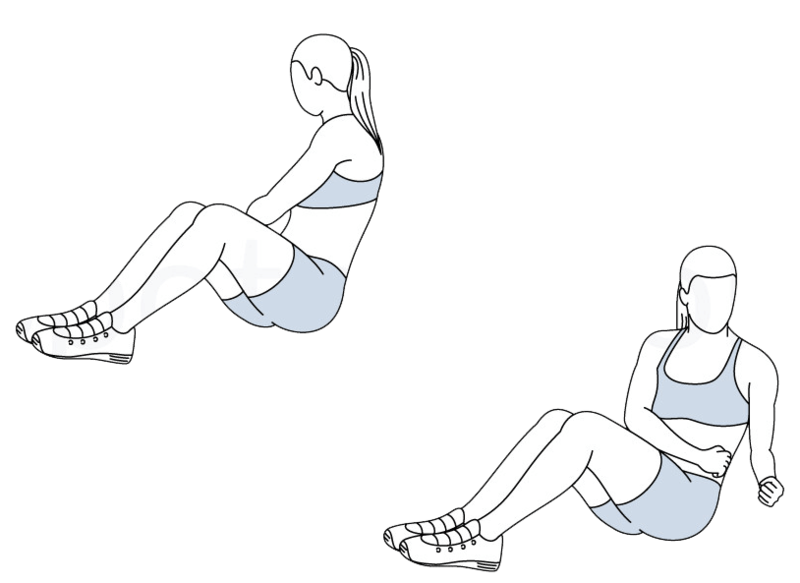 Do three sets of 20 reps.
Drop your left knee to the ground, and rotate your hips counter-clockwise until your right hip is directly over your left hip (perpendicular to the ground). You should look like a T angled on its side with a cute little kickstand. 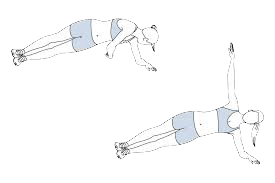 Slowly turn your left arm back to the ground as you lift the right knee to return to full plank. Repeat the process on the other side, drop the left knee, and turn your hips clockwise as your right arm opens to stack the right shoulder over the left. The right leg stays straight over the bent left knee. Squeeze your glutes, repeat the process on the other side and do three sets of ten. Lie flat on your back, lift your arms and legs up so they are extended toward the ceiling. Lift your upper back off the floor to reach your hands toward your feet. Lower your legs toward the floor and touch your arms overhead, keeping your shoulders off the mat and lower back pressed into the ground. Repeat the crunch motion to complete one rep.
Get in plank position with your hands on a 12- to 18-inch step. With your weight on your left arm, rotate your body while raising your right arm toward the ceiling. 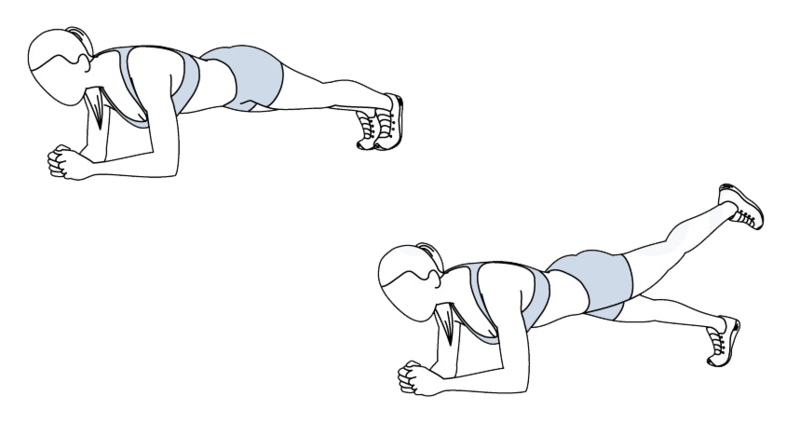 Return to plank position and step your right arm down to the right of the bench, then your left arm down to the left of the bench. Step back up, leading with your left arm. Get into plank position on your forearms and feet. Set your body so it is in a straight line from your head to knee, and tuck your chin. Your spine should remain in neutral alignment. Before each rep, take a deep breath in through your nose, brace your core, actively tuck your rib cage down towards your hips, and squeeze your glutes. This will stabilize your pelvis and spine and will allow you to focus on your upper body. 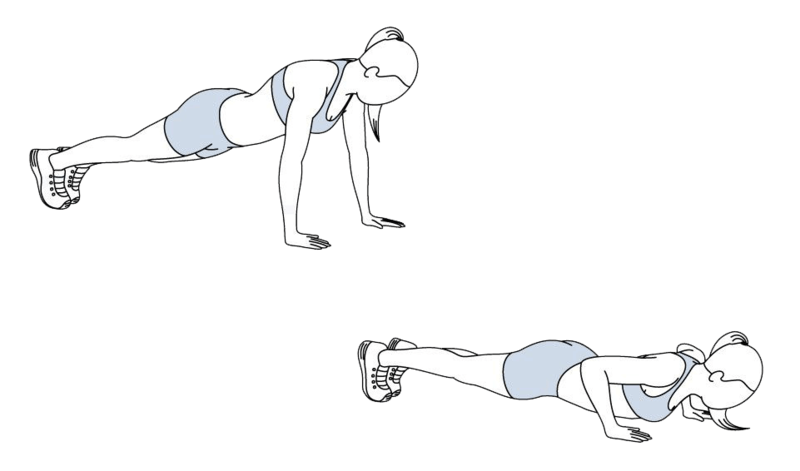 Now press up onto your hands and go into a push-up position and come back down to the starting plank position. You can go up on the same arm and down on the same arm and then switch, or you can alternate every time. Before each rep, reset and repeat the same breathing, bracing, and rib tuck sequence. Stand on your left foot and lift your right knee to hip height in front of your body. Reach your torso forward as you extend your right leg behind you. Keep your standing leg slightly bent as your torso becomes parallel with the floor. Extend your arms overhead to help with balance. Pause for a second, then reverse the movement. Switch standing legs and repeat. Healthy fats will not make you gain weight. In fact, healthy fats help reduce inflammation and prevent inflammation-induced weight gain. Consume almonds, walnuts, macadamia nuts, pine nuts, avocado, fatty fish, chia seeds, flax seeds, pumpkin seeds, olive oil, cheese, dark chocolate, and boiled egg diet. We often think that we should completely avoid carbs to lose weight. But, that’s not true. You need the right type of carbs. Dietary fiber is a type of carb that cannot be digested by humans but aids weight loss by keeping you full for a longer duration and preventing fat absorption. Consume broccoli, flax seeds, prune, peaches, pear, apple, lima beans, black beans, figs, berries, oats bran, barley, green peas, guava, peach, Brussels sprouts, artichokes, pomegranate, kiwi, brown rice, beetroot, quinoa, acorn squash, etc. Most of the times when you are thirsty but don’t drink water, you may think you are hungry and load up on calories. Moreover, not drinking enough water can prevent your cells from performing their functions, leading to slow metabolism, dehydration, constipation, and bloating. All these conditions can lead to stress and inflammation in the body. So, drink at least 2-3 liters of water per day. You can also have infused water, fresh fruit or vegetable juices or smoothies, coconut water, and buttermilk. If you think you will lose weight by starving yourself, you can’t. Not eating for a prolonged period may signal the body to shift to the starvation mode, and it will stop using any calories consumed as usable energy. The extra calories will get stored as fat, leading to weight gain. So, eat every 2-4 hours to keep your metabolism active and the cells functioning properly. Wondering what to eat to get a six pack for women? Irrespective of gender avoiding junk food is always right. High-carb, high-calorie, and zero nutritional value is what is known as junk food. It does nothing but harms your health. Avoid snacking on junk food, such as potato chip, fries, fried chicken, Indian fried snacks, etc., and also avoid midnight snacking. Believe me, if you stop eating junk, you will end up losing a lot of weight. Stress is harmful in many ways. When you are stressed, the hormone cortisol is released, which increases glucose levels in the blood and inhibits digestive functions. This leads to fat deposition in the abdominal area and, in some cases, insulin resistance and diabetes. Yoga, meditation, cardio, weight training, playing a sport, swimming, painting, reading books, traveling, listening to music, and even applying makeup for fun can help you reduce stress. For how long should I do each excercise? 30 sec? 10 reps on each exercise can be effective. How many days should I do this for? Hey i want to start this exercise but i dont know hoe long and how many days to do it? First of all weigh your weight and calculate your BMI. Then set a healthy diet in which include, vegetables, proteins and carbs, but it should be calculated. Then set a goal for 30 days. Do proper these exercises for 30 days and check your results after 30 days, you can prolong it when you will achieve your target. But remember diet is the cure part of achieving six pack. If you have further question you can ask me.